Why YOU should come to the Kansas Turfgrass Conference! Are you still deciding whether to attend the Kansas Turf Conference next week? Here are just a few of the many reasons why that answer should be YES! * In last year’s evaluation, 96% of survey respondents said, “The conference was worth my time and effort.” We think this year’s conference will be too! * In last year’s evaluation, 92% of survey respondents said,”The conference increased my understanding of integrated pest management.” This year includes many different sessions about insects, diseases, and weeds, with lots of opportunities to earn pesticide credit including a hands-on disease id booth in the trade show. * In last year’s evaluation, 91% of survey respondents said, “The conference increased my understanding of people-related skills.” The 2016 conference will feature hot new topics about how to be a better competitor, cultivating professionalism, and more business topics. Here at K-State we love working with all our students. It is particularly gratifying and exciting when they are recognized for their achievements beyond the university. 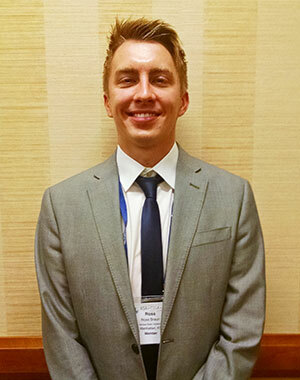 PhD student Ross Braun recently earned not just one, but two awards at the national conference of the Crop Science Society of America C5 (turfgrass) division. He earned first prize in one of the oral presentation categories and third prize in a poster category. Way to go Ross! Here are some tips about knotweed from Ward Upham, in the KSU Horticulture News. 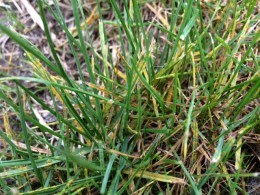 If spring seeding of the lawn is planned, your options are more limited. Buctril can be used on commercial sites and has a very short residual. It must be used on very young knotweed to get control. 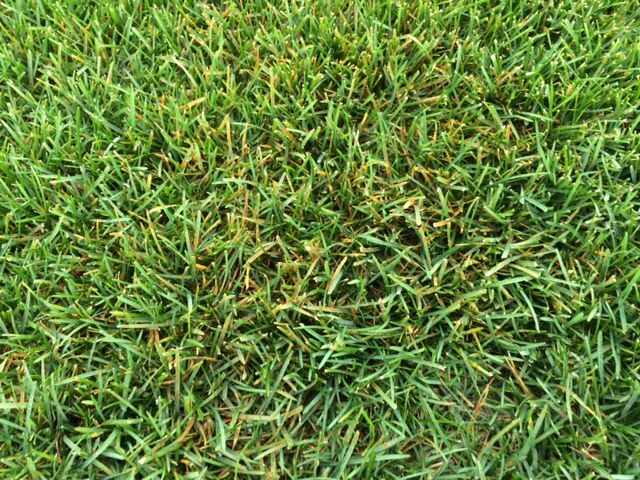 Trimec and others require a month before overseeding to thicken up your lawn. Obviously, don’t use a preemergence herbicide if you are trying to get new seed established. For homeowners seeding in the spring, tilling will control knotweed adequately without using a herbicide. If seeding without tilling (e.g., overseeding using a slicer-seeder), then use a combination product such as one mentioned above just after the knotweed comes up in the spring, and be sure to wait at least a month before seeding. The October issue of Golf Course Management features not just one, but two Kansas superintendents. You can check it out in the online edition. Here is the link to the October Issue of Golf Course Management. Mike Boaz is featured on page 20 and Matt Gourlay is feature on pages 54-56. Great job guys! I love peonies! I’m lucky to have a neighbor down the street with an amazing display every spring. Peonies do need some attention, though, including cutting them back. 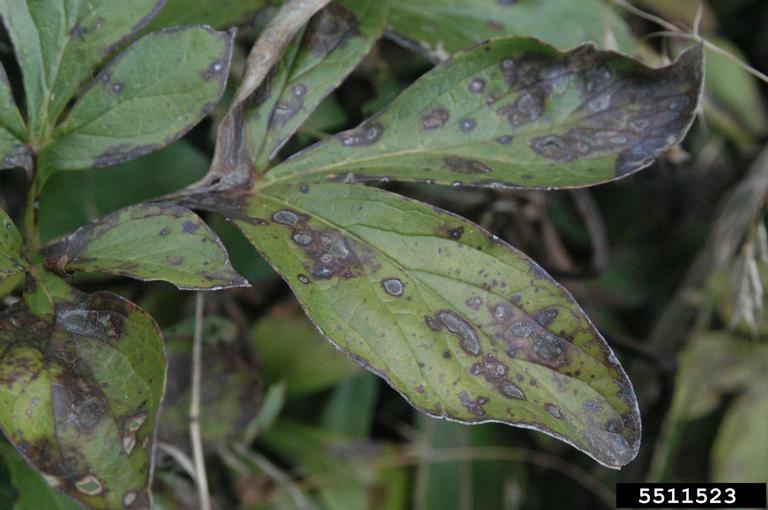 One reason to cut them back is to remove leaves infected with “peony measles.” By removing infecting the leaves from the site you can disrupt the life cycle. The fungus survives year-to-year in infected leaves, so removing them reduces infection risk next year. If phosphorus and potassium are not needed, blood meal makes an excellent fertilizer. Apply at the rate of 2 pounds per 100 square feet or 1 teaspoon per square foot. Turf fertilizers such as a 27-3-3 or 30-3-3 also can be used but at the rate of to 1 pound per 100 square feet or 1 teaspoon per 2 square feet. 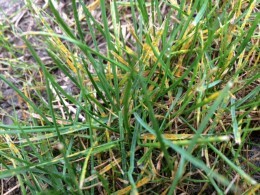 Your zoysiagrass fairways and tees might have tried to dress up like a jack-o-lantern, turning itself orange for Halloween. The moderately cool, moist, foggy conditions are perfect for large patch development. We are seeing it in our inoculated plots at Rocky Ford but in lots of other places too. 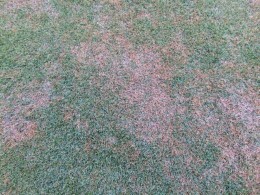 Normally zoysia is shutting down right now. Normally, one application in the fall usually does a great job. You can view a short podcast on large patch fungicide research at KSU. But when the disease is active into November? I’m not sure. 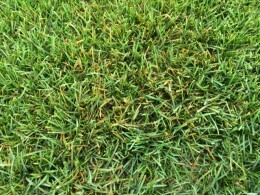 I’ve never seen zoysia this green in November. What a weird fall. Lots of strange things happening in plants. At home we are still harvesting peppers and tomatoes after dinner while comfortably wearing short sleeves, shorts, and sandals. Anyway – what are you seeing out there? Did you treat in mid-September? If so, is it holding? If not, did you go back in? Let us know what is and isn’t working for you. 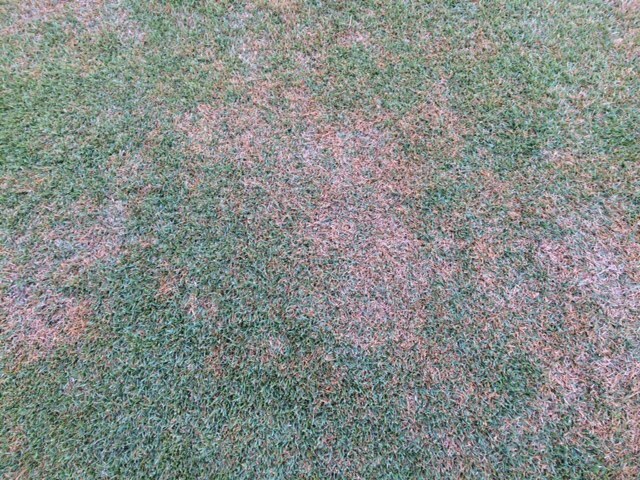 Dollar spot loves, dew, fog, and temperature 65-85 degrees and we have had those conditions lately. As you think about your fungicide program, don’t forget about rotating among different mode-of-action groups. 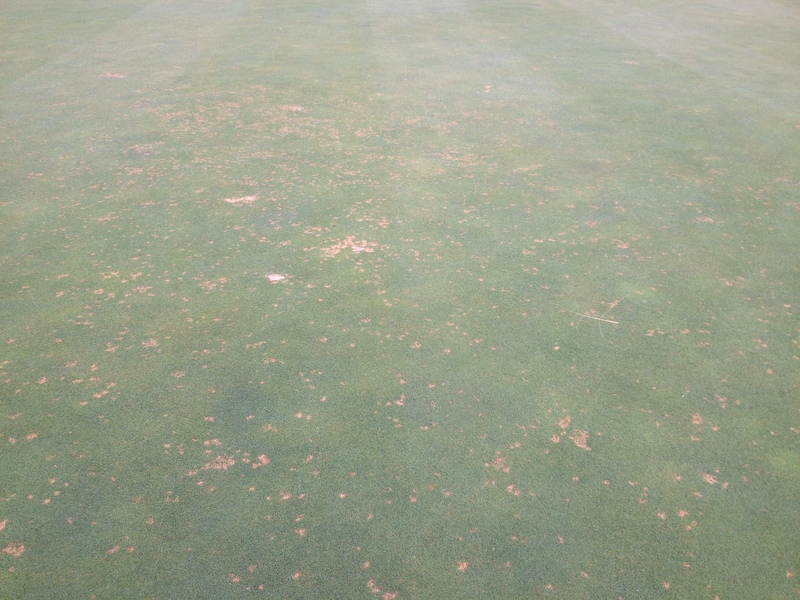 The Chemical Control of Turfgrass Diseases publication from Kentucky does a great job outlining those principles. Don’t forget to look at the active ingredient names and FRAC codes along with the trade name. You might think you are rotating, but you are not. You can read the general info on that page, and/or scroll to the info specific for dollar spot a few pages in. 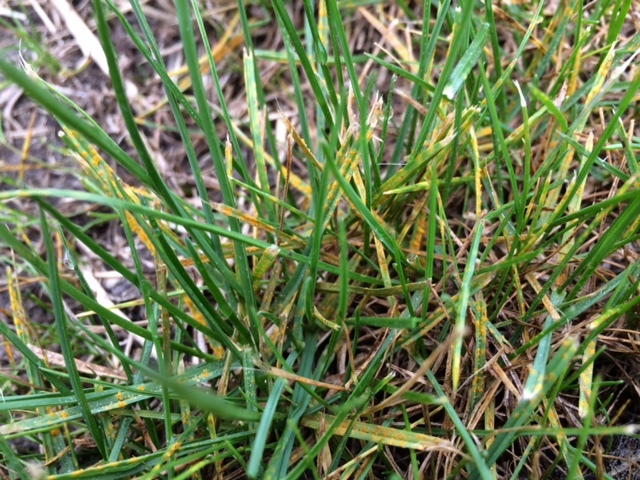 The Kentucky publication highlights some points about fungicide resistance. In a recent survey of isolates collected in Kansas, nearly all were fully resistant to thiophanate-methyl. That is, the fungus blew through it like it was not even there. Over the past 1-2 weeks we’ve been seeing a lot of rust in lawn height turf. At Rocky Ford we are finding it in mainly perennial ryegrass but in little pockets in some newly-established zoysiagrass too. 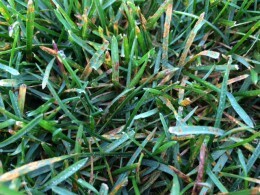 The rust spores need wet leaf surfaces to infect, and we have definitely had some moist, dewy days and even some very foggy mornings. Though the fungus itself spreads best during wet weather, plants that have been stressed by drought are more susceptible. 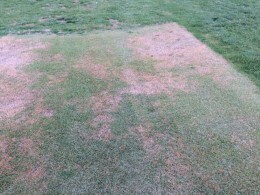 Nutrient-deficient turf is also more susceptible. 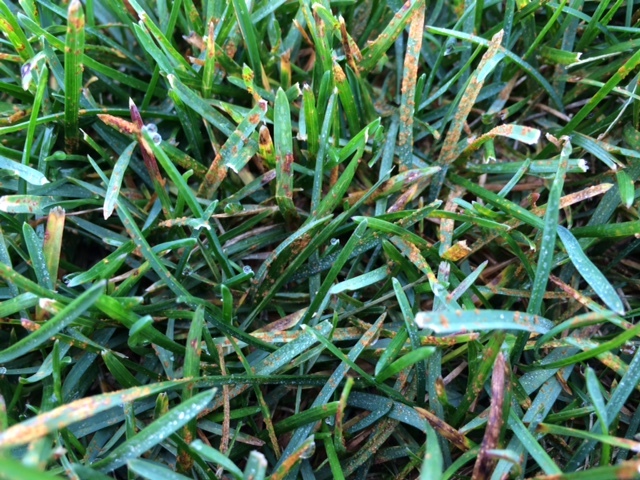 We have some information about rust in our publication Rust Diseases in Turfgrass (pdf). 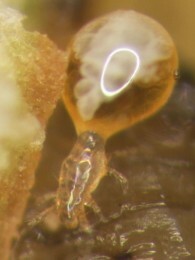 Itch mites. Wow, they are a pain. 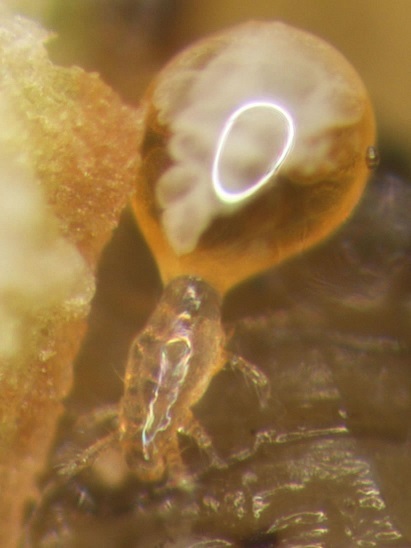 Dr. Ray Cloyd provides some details and images on the KSU Entomology Blog.